I'm Bob Coburn. Tonight Rockline has an evening with Geddy Lee of Rush. A good Rock 'n' Roll band is a process, gathering and disseminating information; turning seemingly unrelated events into a cohesive focus statement, creating music which touches our hearts and our minds. Rush is such a band, and each successive release is a cause for celebration and certainly reason enough for another visit to Rockline; as we welcome Geddy Lee. Geddy, good evening. Welcome Back! Geddy: Hi! Nice to be back. Bob: Nice to have you here this evening. Or in Toronto talking with us, I should say. Now the new CD Presto embodies some changes, one of those Rupert Hine as producer. How'd that come about? Geddy: Well Rupert was somebody we tried to work with a few years ago for the Grace Under Pressure album. And when Peter Collins was unavailable for this record, he was kind of first choice, a natural kind of choice, to see if we could get our schedules together this time, and fortunately he was available and very interested and it all worked out. Bob: Now I noticed you recorded in Toronto and London. Was that a sort of compromise so you could work in each other's territory there? Geddy: Pretty well. We wanted to do everything at home this time and acquiesced and we did three quarters of the record in our home town and then as part of the bargain we said we would agree to go over there to the record so he was happy about that. Bob: Now I heard piano on a couple of songs, is that Rupert playing piano? Geddy: He played on a few tracks, he did some additional keyboards, but also a good friend of ours John Sniderman did some grand piano playing on this record as well. Bob: Some beautiful keyboard work on there. Now you've changed record labels. Has your first album for Atlantic been a positive experience for you so far? Geddy: Yes, so far everybody at Atlantic has been very nice, and it's kind of a fresh start for us to be with some new people. We were with the last label for quite a long time. So it's nice to be at a new place I think. Bob: Could you explain Anthem/Atlantic for those of us in the States that see that on the CD and record label. Is that a Canadian affiliation the Anthem part? Geddy: Yeah, Anthem is our label here in Canada that we've had for quite a few years now distributing our records and there's also a couple of other artists in Canada that are signed to that label. Bob: Now Neil used the analogy or the symbolism of Scissors, Paper and Stone with this. Could you explain that as applied to Rush? What did he mean by that? Geddy: Well it's kind of an abstraction. The kid's game or what you want to call it, that you play with making your fist and making your two fingers into scissors and paper - Paper covers a rock that whole little game. It turned into a nursery rhyme that we put together as a chant in one of the songs - Hand Over Fist. I guess there's lots of different analogies you can make with that kind of a thing. What represents a stone in your life, what is paper and all these different things, but, basically it was, for me anyway, just a rhythmic thing that the whole sound of that chant, to me was a very strong rhythmic thing to write music too. 1. Since you switched from Polygram to Atlantic Records, I was wondering, was there any added pressure on the band since you did this at all? Geddy: Well, I don't think it really came into play very much. Of course anytime you start a new relationship you want to put your best foot forward, but I think that it was a minor consideration at the time. We always have the kind of same attitude everytime we go into make a record - that's to do the best we possibly can. So I don't think it changed that much on this one. 2. If any, what song on the new album was the most difficult for you to do? Geddy: Difficult. I'll have to think about that for a moment. I can't really recall any particular difficult ones, they all came pretty quick and we worked on them for quite a long time in pre-production, so, by the time we got to recording stage, all the bugs were pretty well worked out. So fortunately they all went pretty smoothly. 3. In February you said that you'd be putting an instrumental onto this album. I saw there wasn't one on there, why? Second question is, up here in Western Canada you missed us out on the last couple of tours and I was wondering when you'd be here in Edmonton? Geddy: Okay, first question first. Yes we did plan on putting an instrumental song on this album, but in the process of putting it together Neil kept sending us all these lyrics. He was in the other room and we were just trying to catch up to the guy, we kept telling him to "Slow down, slow down." So we were saving all these bits for an instrumental song and then this one lyric came down the chute and it really suited what we had going for our instrumental track, so we decided 'Oh well, to hell with the instrumental, let's use the lyric." And that song turned into Hand Over Fist. Bob: There you go. And what about touring, will you have a grand tour of Canada, basically was his question? Geddy: Yeah, we will be in Edmonton, I believe there's a date scheduled for sometime in late March. So we will be in that part of the country. Bob: Your tour starts sometime in February, is that correct Geddy? Geddy: I think around the 15th/16th of February. 4. I understood from the program from the Hold Your Fire tour, that you had some influence on the lyrics used, a couple of suggestions of lyrics for songs on that album. Did you have any influence on the lyrics on this one? Or were they all Neil's ideas? Geddy: No mostly Neil's ideas on this one. Although every time we put a song together there's a lot of discussion back and forth; but he was hard at work before we sat down together to write this album, and he had a lot of great ideas - and they kept coming. So yeah, mostly his. Bob: Now you said a moment ago Neil was in the other room working on lyrics. Did you once again go into the country and basically isolate yourselves and concentrate working on the album? Geddy: Yes we did. There was a studio not far from where we live, that we went up Monday to Friday basically and started writing. Neil would work on lyrics and Alex and I on music; and we'd get together in the evening and try to put them all together, and it was really a pleasant environment and it was a lot of fun because this time we had about 4 or 5 months break before we started writing and we were all itching to go and it was nice to get away from anything to do with music for that period of time before hand. 5. It seems like after every live album you change your musical direction. What I was wondering, is this album intended for a more commercial approach? Geddy: I wouldn't say so! We don't really know where we're going until after we've gone there. It's kind of the approach we have. The only thing we decided before we started making this record was that we wanted it to be a bit more directed, a bit more trio orientated, like some records that we'd hadn't done in a while. And that's about it, and then we see what comes out· and basically that's what came out. Bob: It's up to us whether it becomes commercial or not. It really is and that's the truth. 6. I'm curious to know what's kept you guys together, with so little strife for so long? Geddy: Gee. I don't know! Lack of imagination? (laughs) It's a really hard question to answer. We seem, there's a couple of ways of looking at it I think, number one, we seem to, no matter what we're going through individually as people, when we get back together to write, we seem to want to do the same things musically, again and again, which is a surprise every time, but none the less that's what happens. The other thing is, I think there's something about our three personalities that, we do a lot of laughing together, and I think we really have a good time a lot of the time. So I think that's something that has to have something to do with it as well. Bob: And you had some time in between this time around which is unusual for the band, and I would imagine that would kind of let you get in touch with yourself and find out if this is really what you really wanted to do or not? Geddy: Yeah, sure. It's never as free of strife as what people think. Nobody's Perfect, so there are those moments of tension and whatever. 7. I wanted to know, do you think that maybe in the next decade, progressive rock might make a comeback and be kind of the music for the 90's? Geddy: That's such a big question, and I don't think anyone's really capable of seeing what's gonna happen in the future, certainly not with progressive rock, if such a thing is still around. I think it's impossible to say, and I certainly don't feel qualified to make that kind of prophetic statement. But it would be nice to see rock music to get a bit more adventurous again I think. 8. I wanted to know if the three of you had much input on the production of the new album? Geddy: Rupert brought a lot of interesting observations to us in terms of songwriting and arranging and structure. And at one point that affected us as we were putting songs together, and in an overview he was objective and always very comical and collected. He had some good ideas sound wise, and basically he was very even tempered and let the band be, when it needed to be, and when there was problems he stepped in. as any good producer would. So, it was a good relationship, but we felt like we had a lot of input of our own and his input was always pretty succinct and very valuable. 9. If your previous label wanted to produce a 'Greatest Hits' album, would you want to help out choosing the songs for that, or would you want nothing to do with it? Bob: Isn't that in fact coming up? Geddy: Well I don't know! There is some talk of it. Unfortunately those are things that we don't have much control over, but I think it's always in your best interest to try to help out and pick the songs, and oversee the artwork, if you can. I don't know if that's always possible though. Bob: I'm hearing word about an album called Chronicles which is in fact a 'Greatest Hits' album, are you aware of that at this point? Geddy: Yeah there's a rumor about it! 10. I was wondering about the popularity of Tom Sawyer. To me the song kind of packs in all the complexity of the album Hemispheres. So how do you account for the popularity amongst non-musicians and those who don't really follow the band? Geddy: Well I must say I just can't account for the popularity of it, to be quite honest. That song I don't think any of us ever really expected it to be as popular as it has become. I'd say being in the band, it's very hard to judge why, I think we're probably too close to it to see it objectively, so I can't really shed much light on that one. 11. You did some work in the past with Bob & Doug McKenzie, how'd you enjoy that? And do you figure you'll be doing anymore work there with your Canadian background roots there? Geddy: With my background roots eh? Well it was really fun eh, to do that work there on that album, and I enjoyed it plenty. But I don't think there's gonna be much more in the future. It was fun while it lasted. 12. Your music has really matured to a further individualistic level, as well as the lyrics; and in this album especially they're not as blatant from some like John Dos Passos or Ayn Rand, but they're more of a personal level like experience and reflection. And being personal some of them sound kind of angry, and they're really a 'show me don't tell me' point of view. I'd like to know if there is something specific that made Neil write from a more personal aggressive me level, rather than an outside looking in? Geddy: I think it's very hard to describe all the things that make you want to write about the things that you write about. I know for Neil he's a person who's driven by what's going on around him and what's going on in the world. He's constantly travelling and thinking and examining, and he goes through many different things, as we all do; and it's hard to say where these things come from, and yes there are some songs that are angry, and some subjects that, I think, require anger from time to time and I always think that makes for good rock music anyway. So, it's hard to say where the inspiration comes from in any of those songs, and I couldn't really be any more specific, seeing as you'd have to talk to him about that. Bob: Did we have the song Presto first, or was the album called Presto? How did it come about? 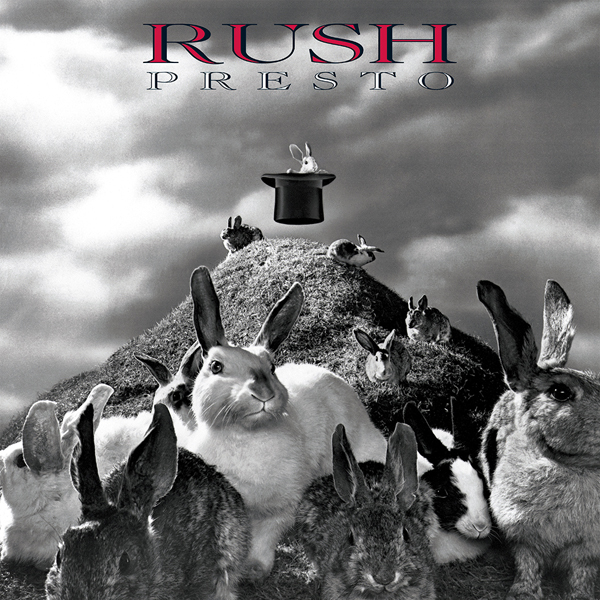 Geddy: Well actually the title Presto was one that we came very close to using for the live album. We decided on A Show Of Hands and it hung around and we still liked it a lot, so it was suggested for this album and at the same time Neil was thinking of a song with the same title. Bob: So you had the album title first, and then Neil came up with the lyrics to create a whole song? Geddy: Well he may of had the idea for the song all along, but I think the title came much before the song. 13. Over the years has it become increasingly tougher to come up with new material? Geddy: Well you always think it's gonna be tough before you start making a record, and I think. every person who writes, whether it's music, books or whatever, you always live with the fear that you're gonna dry up. But once you get into it and once you start rolling, it just starts coming out, and this time in particular, because of the break that we had before- hand, there just seemed to be an abundance of ideas. And it was really a lot of fun working on the songs. 14. When you play in different parts of the world, do you find it necessary to emphasize different parts of your careers to suit your audience? Geddy: That's a good question. Well it may be necessary, but we've never done it. So we always play basically the same show; sometimes what we'll do is shorten the show a little bit if we're playing an area that isn't familiar with our material as another area. So sometimes we'll make that a slightly more condensed version of the show. And some countries, if we're not bringing the entire show with us, we might condense the show for that reason as well, but generally you hope that people around the world respond to the same things. Bob: In what areas outside North America have you been best received? Europe? Japan? Geddy: Well we're very well received in England. Probably England is the best outside of North America. Probably England, Holland, increasingly in Germany, and we've played a few Scandinavian countries and we had quite a good time and a couple of really good shows in Japan a few years back. So, I'd say England primarily. 15. I was reading an interview with Neil Peart in Modern Drummer, and he talked about the new record label Atlantic. So I was wondering what they do differently for Rush that Polygram did? Geddy: Well, who knows, it just came out! So I guess we'll have to wait and see. 16. I heard rumours that your parents are from Czechoslovakia or such and that your name originally is Gary and something or other, and that your parents couldn't pronounce the name so they just called you Geddy and you kept it. Is that true? Geddy: Well some of the facts are a little distorted, but it's kind of like that. Bob: Was it your Grandmother? Geddy: No it was my Mother. Bob: It was your Mother, and she's Polish not Czech and she instead of calling you Gary would call you Geddy? Geddy: Well she thought she was saying that. She thought she was saying Gary, but it's not how everyone else heard it. They thought 'is she calling him Geddy?' No, she's calling me Geddy! It stuck. 17. I would love to learn to play like you do. What's the secret? Geddy: Gee, I don't know. Lots of television! Just practice I guess. I don't know what to say to a question like that. Bob: When did you start? How long have you been playing? Geddy: I guess I started playing when I was about 14. Bob: Did you start on the bass? Or did you start with keyboards? Geddy: I started playing guitar. I was in a little garage band and the bass player quit, and they said "You play bass." And I said "Oh, okay." I thought it was cool because there was two less strings than a guitar, so I thought this has got to be easier, so I just kept it up and just hammered away. I think really the best way to get started is finding a bass player who is really exciting for you to listen to, and you try to emulate what he's doing and then you listen to more and more people and your influences get broader and broader, and then hopefully, eventually you get your own kind of style going. And you have to practice while watching television, very important. 18. Since technology has improved so greatly, would it be possible or probable that a song such as Different Strings or Losing It would ever become part of the live set? Geddy: I think it's certainly possible, but a song like Losing It for example, that has to me, such a personal solo that Ben Mink, our guest artist that played on that record, it would be very difficult for me to think about playing it without having that solo there every night, or at least that person playing it. But I guess you have to change rules in the live situation, so, yeah I guess that those songs could be played and probably slightly changed arrangement wise. Bob: How much of the new album do you intend to play live this time around? Geddy: Well it's a bit early to say. I know there's at least six tunes that we'd like to get in the show, but I don't know. We have so many others to go through and see which are gonna go and which are gonna stay and which older ones we'd like to bring back. So, we haven't officially discussed what songs are gonna stay, or how many from this album we will play. I'd like to see about six if them in there. Bob: We will wait until after the holidays to begin rehearsal? 19. If any of Neil's bike trip tours that he took to the Rocky Mountains or Africa; there were rumours that he was gonna be published. I was wondering if he ever was? Geddy: He hasn't been published yet. Although there are, I think, a few finished journals that he has written, and I think he feels when he gets one written that he's proud of, for the longest period of time, I think that's when he'll decide to go ahead and publish. I wouldn't think that's very far away to be honest. Bob: I hope so. I really enjoy the way that man can turn a phrase. He's outstanding. 20. My friends and I were wondering if the subtitle to the song Anagram has anything to do with the film Blazing Saddles by Mel Brooks? Geddy: Ding, ding, ding, ding, ding, ding. You got it. You win. Yes it's true, it's absolutely true. Bob: Now that's the character that Alex Karras played. Didn't he punch out a horse in that? Geddy: Well, there's a scene, if you recall the film, where - I can't remember the name of the actor who plays the lead - he dressed up as a Candy-Gram delivery man and comes and knocks on the door of the saloon and goes: "Candygram for Mongo, Candygram for Mongo." And Mongo takes the Candygram, and of course it explodes in his face. That's where it comes from. Well spotted. Bob: Hence the subtitle Anagram (for Mongo). Yeah, beautiful. 21. What do the three of you plan on doing after the Presto tour? Geddy: After the Presto tour? I've no idea. Escaping somewhere. No idea. That tour is lying ahead of us. It's like a big hill to climb, so I can't really say. 22. When you're playing in concert, or even in the studio, the three of you work perfectly. I mean there are no flaws in your music that I've heard at all. I just wanted to know what pulled the three of you together? What's your thinking? 'Cos it's like one big brain working when you play. Geddy: Well I don't know, it's...there are flaws and hopefully part of what you do is called craftsmanship, and that craftsmanship means that you can make flaws as indistinguishable as possible. It's hard to answer a question like that. The three of us just plug away together and hope we come up with something that works and satisfies us and other people. I don't know what else to say about that one. 23. I understand you guys played Winnipeg earlier in your career and certain things happened, and you guys vowed that you wouldn't play the city again. I was wondering if you could explain, and if the band was willing to let bygones be bygones? And if Winnipeg's included in your tour plans? Bob: Any truth in any of this? Geddy: Well I don't recall any incidents in Winnipeg of that nature no. I can't really explain why we haven't been there in the last little while, and your guess is as good as mine if we're gonna be there this tour. So we'll just have to see what happens, but, I don't think there's any prejudice against that city. 24. Are there any albums that you thought would de well, be a hit, that didn't and vice versa. Geddy: Well I thought Caress Of Steel would do well and it didn't. But now I understand why when I hear it. I think it's a difficult thing to gauge how well a record is going to do. I didn't really expect Moving Pictures to do as well as it did. And it did very, very well. I think you get so close to it when you're working on it, when you're writing it, and by the time you're finished with it, I don't really think you know what you've got there. At least I don't. You're just far too intimate with the material and just too close to see it. You can't see the forest for the trees kind of thing. So it's always a bit of a surprise what happens one way or the other. 25. There's been a lot of questions about change on this program. In fact you guys have put together so many tunes about change; one change I've noticed with Presto, is it did address ladies more than before, with the songs Super Conductor and War Paint. And it's almost a precedent; females have made their way into your music, have they affected your lives between albums any extent or measure? Geddy: I don't think our relationship with women has changed much over the years -it's pretty much status quo here. I think you're right, I think that is a slight change in some of our songs. And I think that's something we discussed a couple of records ago actually, Neil and I. And how it just turned out that way, that the female point of view or songs describing things about a more feminine nature, were not existent in some of our songs. So, I think that something that's probably linked around the back of our minds. 26. What's slated for Texas? Concert dates. Geddy: I can't really tell you, I'm really not very familiar with our tour schedule at all. I know that we are going to be in Texas in the first portion of the tour, so I would assume it's early March. That's all I can tell you. 27. I begin to wonder whether Rush would ever semi-retire? And during the Signals album, Losing It gave me a hint, possibly you may be doing that. Any truth to that? Geddy: No. Losing It, that was a false impression you got from that song. I think we sort of have semi-retired, but we didn't tell anyone, and we forgot to tell ourselves. And we're still here, we keep forgetting to retire I think is our problem. No I don't think we really know what's happening one record to the next, but, this record, again I hate to sound redundant here, there was a really positive experience making this record and I think it bodes well for the future. So I guess that's all I can say about that. 28. On the video for A Show Of Hands, Alex says something during La Villa Strangiato, and the producer's apology comes up. I was wondering what that was all about? Geddy: That's kind if a joke, but it doesn't seem like many people are getting that joke. Actually, Alex at certain parts of that song would just start rambling into the microphone, all kinds of various nonsense. It actually never got recorded, anywhere. So no one had any idea, including him, what he'd actually said. But we loved the shot of him just ranting into this microphone. So we decided we'd put up this bogus radioactive warning about the fact that we'd censored what he'd said. We thought we did it in an obvious way that it looked like it was phony because we put the radioactivity symbol right on the screen, but nobody seems to be getting that. That's the explanation after all this time. He was babbling. He's a good babbler. 29. I know 2112 is out on CD. But I was wondering if it would be coming out on a hi-fidelity CD? Such as the Pink Floyd Dark Side Of The Moon or Elton John's Yellow Brick Road? Geddy: I couldn't tell you that. I have no idea. I didn't know such a thing existed to be honest. So I don't really know. I couldn't tell you. Bob: Thanks to everybody for listening and calling. Special thanks to Ray Daniels and Kim Garner of SRO productions, and of course to you Geddy Lee, and please pass on to the other two guys in the band, to Neil and Alex; can't wait to see you live and congratulations on a really fine record again! Geddy: Thanks very much, it's been great being here once again. Bob: Thanks Geddy, always a pleasure to talk with you.